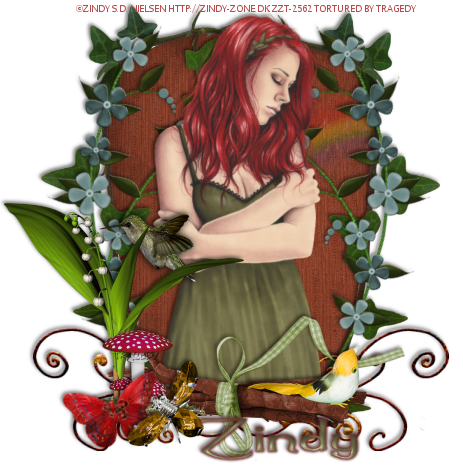 Secret Garden Collection by Zindy & CBJ. Get it HERE. Using your lasso tool select around the ivy making a straight line across the bottom. Add a new raster layer under the ivy. C/P Forget Me Not Flowers. Use your deform tool to line up with the left side of teh ivy. Position over the bottom line of the paper layer. Move under the tube layer. Position over the bottom of your tube. Use your eraser tool to remove the bottom part of the ribbon. Position over the left side of the sticks. Use your deform tool to position over the left side of the grass. Position over the right side of the grass on the mushroom.